Unspoiled and friendly; a country with enormous diversity and one of the few places in the world with a completely pristine tropical rainforest. Meet two authentic cultures in the Suriname interior. The culture of the original inhabitants, the Amerindians, divided in five tribes, each with their own language and customs. The Amerindians comprise of the Trio, the Wajana and the Akurio tribe from the southern part of Suriname, also called Upland Amerindians who lived almost completely isolated for decades. Immediate contact with the Akurio’s only occurred approximately sixty years ago when they were found seemingly still living in the stone age. And the culture of the Maroons. They are descendants of slaves who, during the slavery period, managed to escape their oppressors and settled in the forest of the hinterland. The six existing Maroon tribes display interesting differences in culture and language. Some even speak languages derived from the Yoruba’s and Bantoes from West Africa. Suriname is known for its sustainable commitment to nature conservation and over 80 percent of its original forest is still intact. The Government of Suriname, together with Conservation International, created the Central Suriname Nature Reserve. 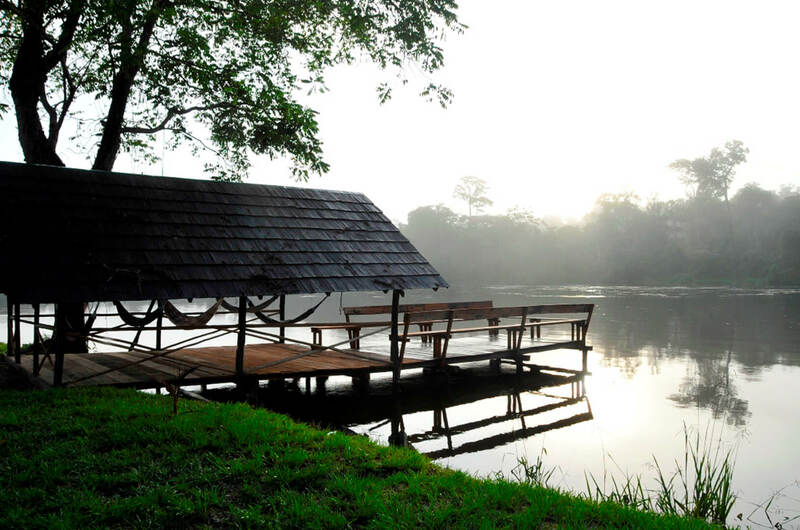 The Central Suriname Nature Reserve comprises of over 1.6 million hectares of primary tropical forest in the upper Coppename watershed of West-Central Suriname. The Reserve forms a corridor which links the three existing protected areas: Raleigh Falls, Tafelberg and Eilerts de Haan Gebergte. 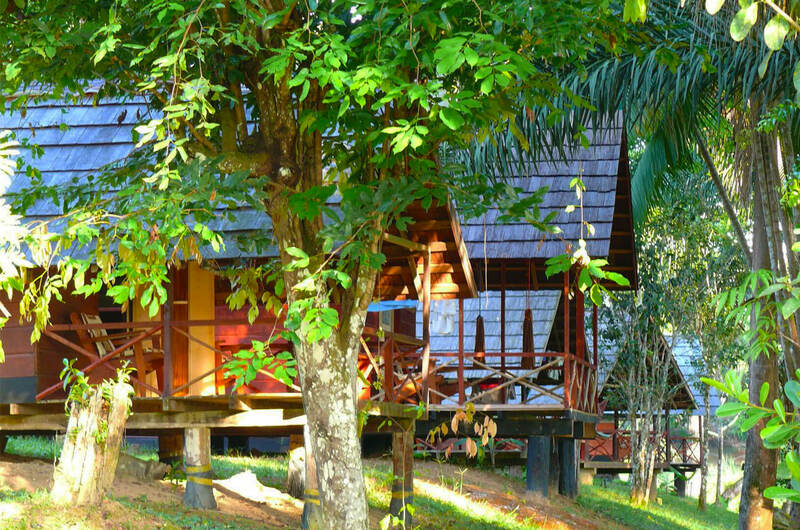 In addition, the Surinamese interior offers an overwhelming nature of tall trees, large meandering rivers and impressive rapids and at nightfall, enchanting sounds which all form part of the tropical rainforest. But Suriname is also famous for its capital city Paramaribo considered by many a true museum. Historical buildings which take you back to the Dutch, English, French, Spanish and Portuguese presence of centuries ago. Suriname is not only inhabited by Amerindians and Maroons but also by East-Indians, Javanese, Creole, Chinese, Europeans and other ethnic groups. A melting pot of cultures which is strongly evident in everyday life in Surinam: a mosque right next to a synagogue, a nasi goring or roti meal, typical Creole Kaseko music or the Chinese Dragon dance… all of this makes Suriname so unique. The city center Paramaribo and the Central Suriname Nature Reserve are both placed on the “World heritage site list” of the UNESCO. In the capital city Paramaribo, a mosaic of various ethnic groups and cultures resembles an exotic miniature world. The bustling city life is muted by shady, tree-lined avenues interspersed with seventeenth-century Dutch wooden structures, interchanged with modern hotels and office buildings. With a unique blend of architecture, cultures and religion, Paramaribo is one of the few places in the world where Muslim mosques, Hindu temples, Jewish synagogues and Christian churches all coexist peacefully, side by side. In the busy Central Market, the scent of tropical fruits and exotic spices fills the air. Shoppers can visit various stalls bulging with brightly colored oriental silks and batiks, handcrafted gold jewelry, native woodcarvings, fresh tropical fruits and vegetables. All over the capital city, the rich influence of African, Indonesian, Indian, Creole and Dutch cultures abound and a splendid array of restaurants allows one to savor a different, tantalizing cuisine every day of the week. Surinamese culture is unique from other areas of South America or the Caribbean. In addition to the native Amerindian population and Maroons, the country’s population includes: Creoles, Indians, Javanese, Chinese, Dutch and a variety of other small groups of European origin. Also one of the oldest Jewish communities in the America’s reside her. Maroons are the direct descendants of Africans brought to Suriname, during the 17th century, primarily from West Africa for the express purpose of enslavement. Today still a great part of the Maroons live in villages scattered gracefully on rivers, a few miles south of the Atlantic Ocean down to the Brazilian border at the base of the Amazon Rainforest, as well as to the Eastern part of this country, close to the border with French Guiana. There are six groups or tribes of Maroons, each having its own leader or “Granman” (Grand Chief). They are the Ndjuka (also commonly referred to today as Aucaners), Saramaka, Paramaka, Matawai, Aluku or Boni and Kwinti. Each of their tribes has managed to successfully maintain their African-based culture (including their languages). While the exact date of the arrival of West Africans for enslavement in Suriname is unknown, it is generally accepted that they were brought here in the early 1600s. Extremely significant to prospective and returning visitors about this population is that the Maroons of today continue to live according to the traditions as their ancestors did over 400 years ago. This state of purity remains the most important attraction. Until the 15th century, the only inhabitants of Suriname were the Carib, Arowak and Warao Amerindians. Another tribe, the Surinen, inhabited the country at an earlier time but was driven away by the Caribs. The name of this tribe is said to be the source of the name Suriname. 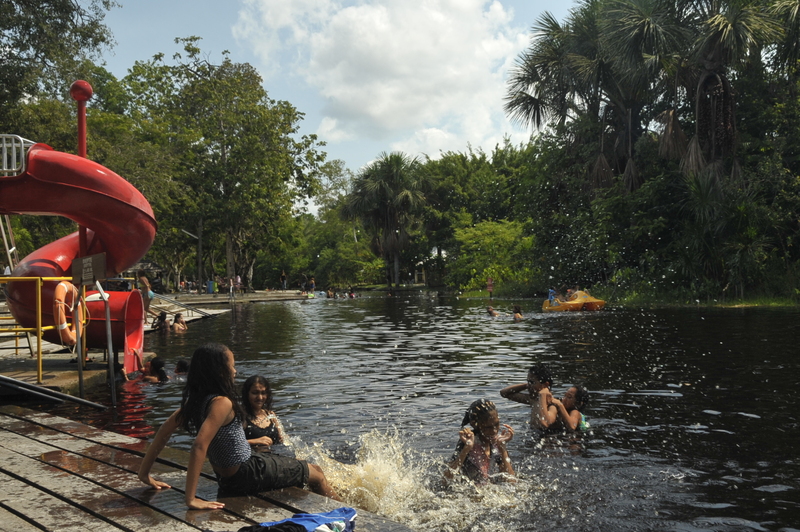 Today, the Warao exist only in Guyana and Venezuela. The five major tribes inhabiting Suriname are: the Caribs, the Arowaks, the Trio’s, the Wajanas and the Akurio’s. The Amerindians of Suriname have long been divided into two categories – the “Benedenlandse Indianen” and the “Bovenlandse Indianen” in the coastal area and along the lower reaches of the major rivers. The coastal tribes (Caribs and Arowaks) have been in almost constant contact with Western society. The interior tribes – Trio’s, Akurio’s and Wajanas inhabit one of the most remote corners in all of South America and it is only during the last 30 years that they have been in regular contact with the outside world via the presence of missionaries. On the Northeast coast of South America, the Republic of Suriname is bordered by Guyana to the West, French Guiana to the East and Brazil to the South. One of the least densely populated tropical countries in the world; approximately 95 percent of the 450.000 inhabitants live in the capital city Paramaribo and in small villages located along the coast and riverbanks. Suriname is ideally suited for the conservation of its unique neo tropical Rainforest biome. While Suriname is a relatively small country, it is internationally quite significant, because it has one of the highest percentages of tropical cover in the world with over 80 percent of the total area covered by forests and a rate of destruction under 0.1 percent annually. It has nine times the forest size of Costa Rica and more tropical forest than all but four African countries. Exotic plant and animal life abound in the largely uninhabited and undisturbed rainforest and the country also boasts 13 natural reserves and one Nature Park. The country is rich in wildlife, including at least 700 species of birds, 200 mammal species, 130 reptile species, 99 amphibian species and countless thousands of botanical species, the majority of which has never been botanically surveyed. 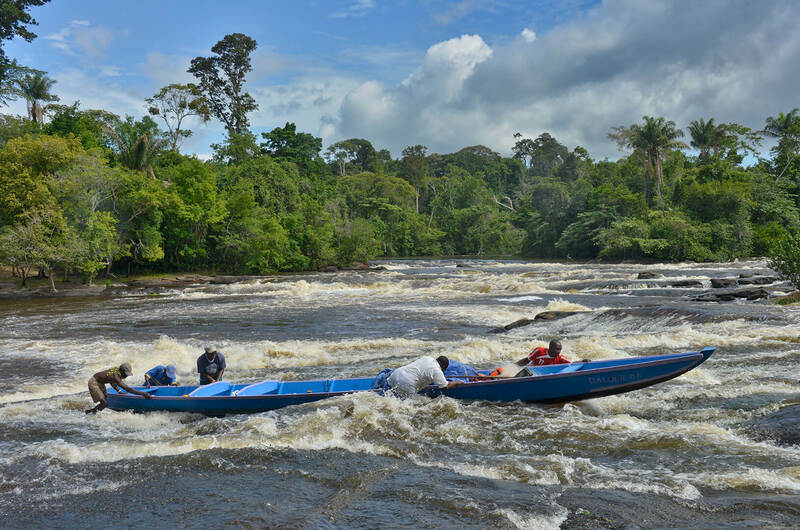 With almost 3.000 miles of waterways, Suriname is also known for being a land of winding and turbulent rivers. Less known, but just as intriguing, are the rich savannahs, coastal plains and swamp-lands. On the coastline each year from February through August, sea turtles such as the leatherback, make landfall and hatch their young. The official language is Dutch, but English is widely spoken along the coast. The only language spoken throughout the country is “Sranan-Tongo”, a language composed of English, Dutch, French, Portuguese and African roots. The many different ethnic groups and tribes also speak their own language. Suriname is a country of sunshine. No day goes by without rays of sun, even during the rainy season. According to European standards Suriname is of course considered to be a warm country but due to the cool breeze of the northeast trade wind, an average daytime temperature of 28 degrees is perfectly bearable. The same applies to the interior where the temperature can drop to about 20 degrees at night. The tropical rainy season (Green Season) is from mid-April to mid-July and a short rainy season from December-January. The two dry seasons are from mid-July to November and February to mid-April. One Surinamese dollar equals 100 cents. Notes are in denominations of 100, 50, 20, 10 en 5. Some stores in the city accept US dollars or Euro. Foreign currency can be changed at local banks or currency exchange offices called cambio’s. A few hotels and companies accept credit cards such as ‘Visa’ and ‘Master’ Payments by travelers’ cheques and credit cards are charged with administration costs and are not generally accepted. It is advised to travel with cash in US-dollars or Euro. The currency in Suriname is 110/127 volts and 60 cycles. Electricity is not available in most parts of the interior. In some places, lighting generators and solar energy are used. Surinam Airways offers international and regional flights to Suriname from Miami (USA), Amsterdam (Netherlands), Belem (Brazil), Willemstad (Curacao), Oranjestad (Aruba) Georgetown (Guyana) and Port of Spain (Trinidad). Other airlines offering services to Suriname are KLM, META, Insel Air and Caribbean Airlines. Transportation in the capital city is commonly by bus or taxi. Note: most taxis are not marked as such and have no taximeter. Most hotel staff will be happy to offer taxi arrangements but visitors are in general advised to ask for the taxi price in advance, prior to taking part in the ride. Some destination in the interior are very remote and can only be reached by small aircraft. The primary mode of transportation is by dug-out canoe (korjaal) with outboard engine and on foot. Travel visa and a passport, valid for at least 6 months after intended stay in Suriname are normally required. 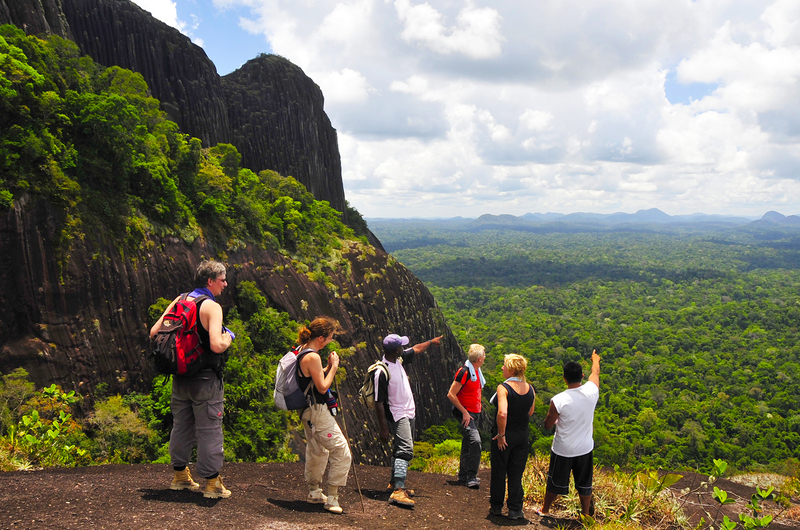 On November 25, 2011, the Government of Suriname introduced a “Tourist Card” in addition to the existing visa types. The “Tourist Card” allows passport holders one entry to the Republic of Suriname for tourist purposes. For more information, please contact the Foreign Affairs Department of Suriname or the embassy or consular office in your country. NB. A multiple visa is required for a visit to Suriname and re-entry for further travel. For example, a visit to French Guyana from Suriname, followed by re-entry in Suriname. Tourist visa costs vary between € 40, – and € 45.00, – valid 2 months. The “Tourist Card” costs $35.00 (U.S.) [€30.00] and can is available at the port of entry in Suriname (at Johan Adolf Pengel International Airport). Traveler’s must present a valid passport (minimum six months) and a return ticket. The Tourist Card is valid 90 days, starting from the date of entry. Suriname has very potable water of high quality which can be used straight from the tap, also as drinking water. The water in the interior must be boiled first prior to use as drinking water. For visiting the interior, in some areas, a malaria prophylaxis cure is required. Please consult your physician prior to departure from your country of origin.